Do you want to do the Classic Salkantay to Inca Trail? but it is sold out. Inca Trail Machu has created a new alternative hiking to Machu Picchu. Salkantay Inca Trail involves 5 day hike on the famous Salkantay trek and 2 day hike to the Short Inca Trail. This hike is the best alternative hikes to the 7 day Salkantay to Inca Trail. Not along the typical tourist trail path, this is an innovating adventure for travelers who want a little more solitude and individuality on their journey. With impressive views, such as Umantay Mountain and Lake, the Salkantay Mountain, Llactapata ruins, Challacancha ruins, Wiñaywayna ruins and Machu Picchu citadel.. This is one of the most interesting and enjoyable alternative hike to the Inca Trail due to the wide range of plant diversity, various ecosystems, remote Andean villages, and views of the snow-capped Umantay and Salkantay Mountain as well as of the Llactapata Incan site on the peak of a mountain, just behind the Machu Picchu Mountain, Chachabamba and Wiñaywayna ruins on the Inca Trail. This trail finally reaches Aguas Calientes, located at the foothill of the historical and archaeological site of Machu Picchu, from where we hike in early morning up to lost city of the Incas to see the sunrise above it. Then our English speaking tour guide takes us around this incredible Incan citadel. Day 06: Machu Picchu - Cusco. Crew: A Inca Trail Machu Representative in Cusco and a professional Tour Guige, a Cook, and Horseman for the Salkantay to Inca Trail. Accommodation: Campsites (4 nights), Hotel in Machu Picchu (1 night). Meals: 5x breakfast, 5x lunch, 5x dinner, 4x afternoon tea. There are spots available everyday, our departure is 100% guaranteeed. if you would like to book. Send your request information, you can find on the right on the website. How can you book the Salkantay to Inca Trail? The Salkantay Inca Trail starts on the fiveth day of the Salkantay to Inca Trail! if you like to start the tour on the 10th of May, you need to check Inca Trail availability on May 14th!. If there is still availability of the Inca Trail on your date requested in the time of your booking. What is included on the Trek? Experienced bilingual Tour Guide. They all grew up in this region and have a true passion to teach others about their heritage. They are fun yet professional, and will ensure you are safe and happy. Our tents are of the brand Eureka Mountain double designated for 4 seasons. We provide with 3 person capacity tents; however, just 2 trek participants use it! In this way, we provide you more space and comfort. In case of a single traveller, we provide with a 2 person capacity tent. Included the Salkantay, Inca Trail and Machu Picchu. The Inca Trail Machu chefs cook delicious meals that many previous trekkers have raved about. If you are a vegetarian or have any restrictions, our chef will prepare special food, please advise us in advance. A vegetarian meal option is for NO extra cost. Food is typically served and buffet. Excluding the first 4 hours of the trek when you need to bring your own, Inca Trail Machu will supply all the water needed. This water will be boiled, filtered and then cooled, before distributing. You must supply your own water bottles or camel back. We recommend carrying about 3L worth. We will refill our waters at each meal. Inca Trail Machu DOES NOT permit this exploitation!! We guarantee that our horses carry only an amount given by the Peruvian law!! On the high season, it is very important let us know in advance, because it is very difficult find spaces available. Our guide has received training in first aid from a physician. Your tour guide will always have a first-aid kit for basic medical problems (traveler’s diarrhea, cuts, scrapes, etc.) and oxygen. A T-shirt of the Salkantay Trek Map;. Here is everything you need to know about Salkantay Trek Peru, one of our most impressive routes. Starting Elevation “Mollepata” 2 803m a.s.l. 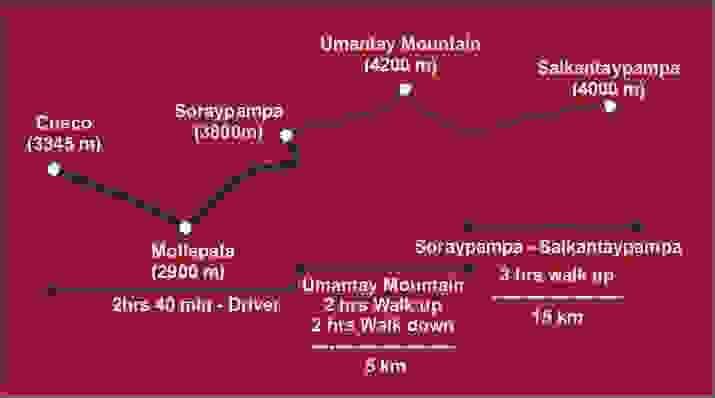 “Soraypampa” at 3 750m a.s.l. "Humantay" at 5 917m a.s.l. "Salkantay" at 6 271m a.s.l. "Salkantay Pampa" at 4 100m a.s.l. "Frozen Inca Pass" at 5 100m a.s.l. "Pampacawana" at 4 000m a.s.l. "Paucarcancha" at 3 205m a.s.l. "Wayllabamba" at 3 000m a.s.l. "Llullucha Pampa" at 3 855m a.s.l. "Dead Woman´s Pass" at 4 200m a.s.l. "Pacaymayo Valley" at 3 300m a.s.l. "Abra Runkurakay" at 3 860m a.s.l. "Chaquicocha" at 3 670m a.s.l. "Phuyupatamarca Pass" at 3 670m a.s.l. "Phuyupatamarca Incan Complex" at 3 600m a.s.l. "Wiñayhuayna" at 2 700m a.s.l. How many kilometers is walked during the Salkantay Trek to Machu Picchu and how many hours do we walk per day? The total distance involves about 74 km, climbing about 1 800m through glaciers, snow, and some rock; that´s why accessing the route typically involves three days of travel from Cusco. What does "Salkantay" and "Machu Picchu" mean? How difficult is the Salkantay Trek to Machu Picchu? Is it possible to do the Salkantay Trek to Machu Picchu on my own?